To make the greatest positive impact on the world around us, Gensler is organized as a single cohesive community that’s connected across the globe, working with shared values and shared purpose. This year, we reshaped our network as One Community that’s able to bring Gensler’s unique strengths to the marketplace and drive transformation for our clients anywhere in the world. By creating a dynamic network of leaders who can accelerate strategy, simplify communication, and ensure connectivity, there’s no limit to what we can accomplish. This annual report highlights four key areas that go to the core of who we are. Taken together, these stories capture the essence of our One Community approach, which is about the global reach and diversity of our firm. Read more to learn about who we are. Diversity of talent expands our reach. We value a collaborative, passionate team of people with diverse backgrounds, perspectives, and talents to ignite innovation and add breadth to our global practice. Our talent pipeline reflects the diverse nature of our world, putting our values and purpose at the core of everything we do. Investing in platforms that drive innovation. We are committed to programs that grow our knowledge and expand technology infrastructure. We dedicate significant resources to research, design technology, new ventures, and design innovation platforms to increase the value we deliver to clients. As a design firm in 48 locations, we are uniquely poised to help make the world a better place. We engage with our communities to address the major issues they face, from health and wellness to housing and homelessness—while paying it forward for the next generation. A design culture that transforms experience. We strive to create a culture of design innovation, encouraging experimentation and risk-taking to promote diverse thinking that can inject new ideas into our design process. By celebrating our accomplishments, we champion great design that improves people’s everyday experiences. Our 2018 Annual Report highlights four key areas that go to the core of who we are. 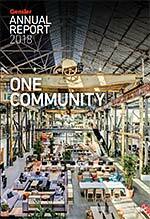 Taken together, these stories capture the essence of our One Community approach, which is about the global reach and diversity of our firm.